Sebastian Malheur is one of the most revered naturalists of his day… and one of the most reviled men in England. After all, he gives public lectures about reproduction and genetics and that is simply Not Done in polite company. Imagine how much more scandalous it would be if word got out that his pioneering discoveries about inherited traits were actually made by a woman! Violet Waterfield, the Countess of Cambury, is the brilliant scientific mind behind all of Sebastian’s theories. Childhood friends, he offered to present her findings to publishers after they all refused to even look at her work so long as her name was attached. Neither one expected him to rocket to fame under false pretenses, and the strain of keeping the secret and dealing with public hatred is wearing on Sebastian. He tells Violet that he’s done, and she has to decide if it’s worth the blow to her reputation and the risk of having her family shunned to finally step out and take credit for all she’s accomplished. There’s also the small matter that Sebastian has been madly in love with Violet for years. She’s a widow, but her marriage left her traumatized in ways she can’t admit to anyone around her and she’s terrified of getting too close to anyone, especially a man with a reputation of being a rake. Slowly, Violet manages to overcome what amounts to a raging case of PTSD and learns that Sebastian can be trusted not to mistreat her the way her late husband did. I loved this book. Sure, the author takes some liberties with scientific history, but I love watching Violet’s mind work to puzzle out why some species of violets can be crossed but not others. Her backstory, when it finally comes out (though it was pretty easy to guess at a lot of it), is heartbreaking. It’s depressingly realistic that she’d have trouble reconciling herself to love again and would be continuously surprised that Sebastian basically meets the minimum standards of human decency by respecting her boundaries and not forcing himself on her at every turn. Sebastian also has a side story in which he tries desperately to earn his older brother’s respect, which is hard for him to deal with while also recognizing that his reputation is a fraud. Fortunately everything finally works out in the end! 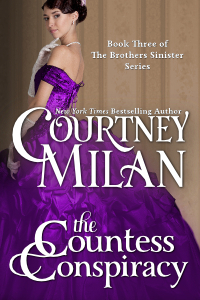 The Countess Conspiracy is the third book in Courtney Milan’s Brothers Sinister series. I also reviewed book two, The Heiress Effect, on Cannonball Read. This post originally appeared on Cannonball Read as well. Disclosure: I received an advance reader’s copy of The Countess Conspiracy from Victory Editing via Netgalley in exchange for my fair review. All opinions are my own. This entry was posted in Books and tagged #cbr6, brothers sinister, cannonball read, Courtney Milan, crosspost, historical romance, The Countess Conspiracy. Bookmark the permalink.